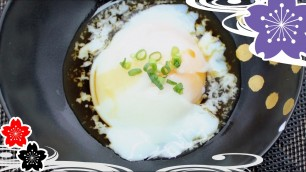 You can cook this "Easy Onsen Egg" by putting eggs in boiled water. You can also enjoy eating them as a salad or a topping of Udon. Pour much water enough to cover eggs in a smaller pot. When it is boiled up, turn off the heat. Put eggs in boiled water. When eggs are returned to room temperature, let them for 10 minutes. When the eggs are still cool, let them for 12 minutes. Cover the pot definitely. Take eggs out from the pots and put them into cold water. Let them cool. Dish them up and pour 1/2 tablespoon of dashi-tsuyu. ✍This dish is easy to make only by putting eggs in boiled water. When you let them for 15 minutes, it will be soft-boiled eggs. Adjust time yourself to your purpose.